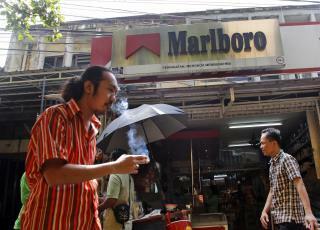 (Newser) – Philip Morris International—the largest publicly traded tobacco firm in the world—"is running a secretive campaign" against a World Health Organization treaty credited with saving millions of lives in what could be "one of the broadest corporate lobbying efforts in existence," Reuters reports.The news agency got its hands on thousands of pages of emails, PowerPoint presentations, national lobbying plans, and more that were never meant to be seen outside Philip Morris. The documents regard the actions taken by Philip Morris to undermine the Framework Convention on Tobacco Control treaty, which the company in internal documents calls a "regulatory runaway train" championed by "anti-tobacco extremists." ........ The news agency got its hands on ....... I've never smoked, but that is not the point. The scum sucking ratings and revenue driven media will print anything that makes a story. What right did they have to STEAL and publish this info? Yeah, I think it's stealing, even if it's in cyber space. The media is at the point where anything you put in electronic communication is not safe from them. And remember, that means your stuff too, if they think it will cause any issues between two parties, that's news. Ick! That's gotta be the result of a tobacco juice leak, huh? Ick!